Dep. Min. Michael Oren suggests US deport PA envoy after PA calls for Ambassador Friedman to be labelled a 'terrorist'. The Palestinian Authority has called for the American ambassador to Israel to be placed on an international terror watch list, days after PA chief Mahmoud Abbas called the ambassador a “son of a dog”. 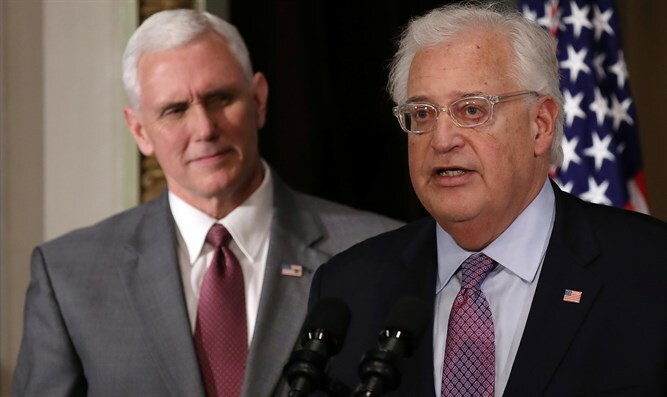 PA officials ramped up their rhetoric against US Ambassador to Israel David Friedman on Thursday, with the PA’s Information Ministry publishing a report calling for Friedman to be added to a “global terror list”. The Palestinian Authority has targeted Ambassador Friedman this week, after the ambassador criticized the PA for refusing to condemn a series of terrorist attacks that left three Israeli Jews dead in Jerusalem and Samaria. Mahmoud Abbas responded by calling Friedman a “son of a dog”. The United States legitimizes settlements," Abbas said during a meeting of senior PA leaders in Ramallah. "That's what American officials do, and at their head, in Tel Aviv, is David Friedman. He said, 'They're building on their own land.' The son of a dog, they're building on their own land? He himself is a settler, and his entire family are settlers." Following Abbas’ verbal assault, Ambassador Friedman suggested the comments were anti-Semitic. On Wednesday, the official PA daily Al-Hayat Al-Jadida carried an article bearing the headline, "[PA] Ministry of Foreign Affairs and Expatriates: Friedman's positions are anti-Semitic and racist and disqualify him." But that apparently wasn’t enough for the PA’s Ministry of Information, which on Thursday released a report entitled: “Friedman, the Ambassador of Settlements and Lawyer of Extremism”, Israeli media outlets reported. In the report, the PA accuses Friedman of pushing “ethnic cleansing”, and urged he be added to a “global terror list” – though no particular list was specified. Former Israeli Ambassador to the United States Michael Oren (Kulanu), now an MK and Deputy Minister in the Netanyahu government, mocked the PA’s demand in a tweet early Friday morning, and suggested the US respond by deporting the PA envoy to Washington.